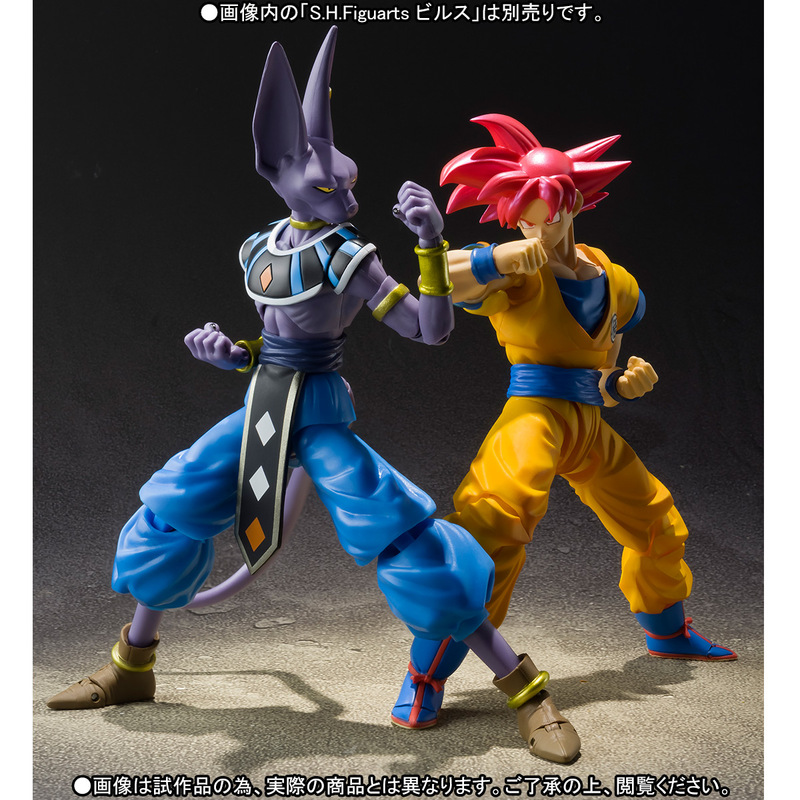 Now fans can take on Beerus properly with the upcoming Super Saiyan God Son Goku figure! 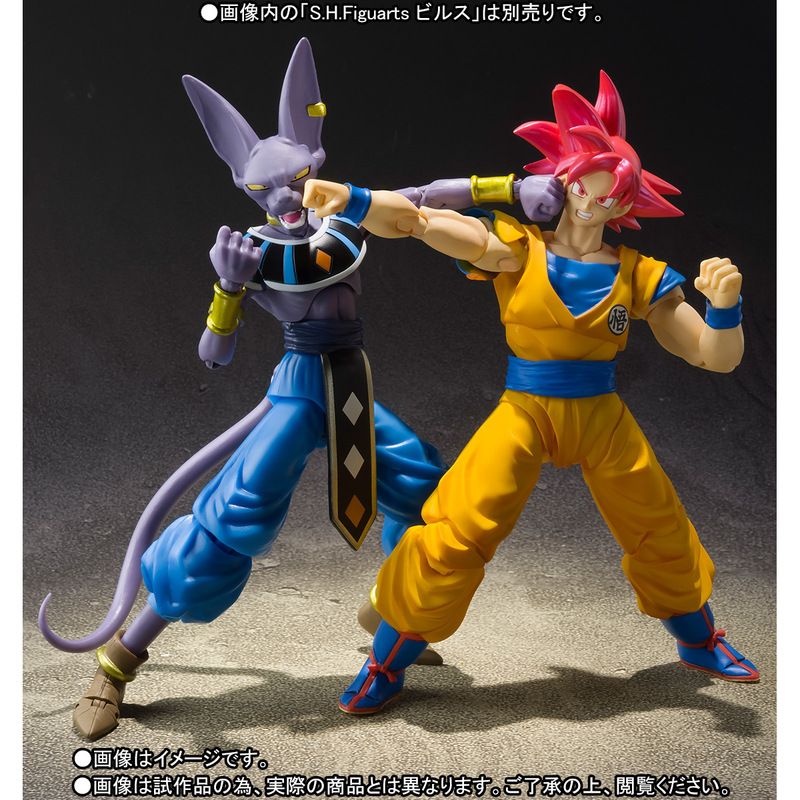 The official product page has been posted for the upcoming Dragon Ball Z S.H. 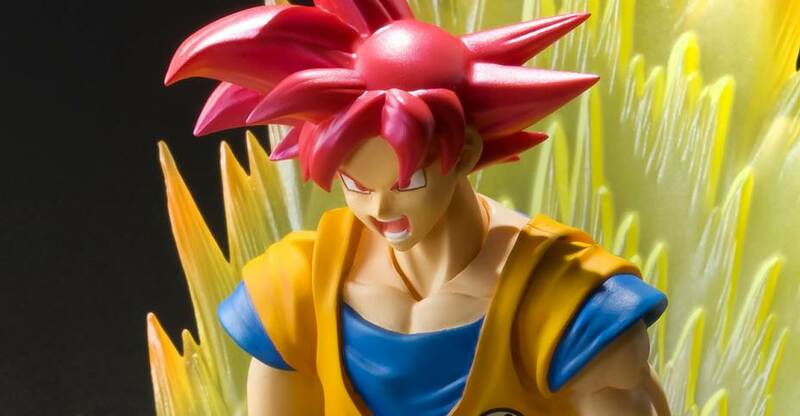 Figuarts Super Saiyan God Son Goku by Tamashii Nations. The figure will be a Bandai Premium Web Exclusive. The figure will stand a little over 5.5″ tall and will include three interchangeable face parts and four swappable hands. It features a different, bulkier, body style than the version originally shown in 2015. 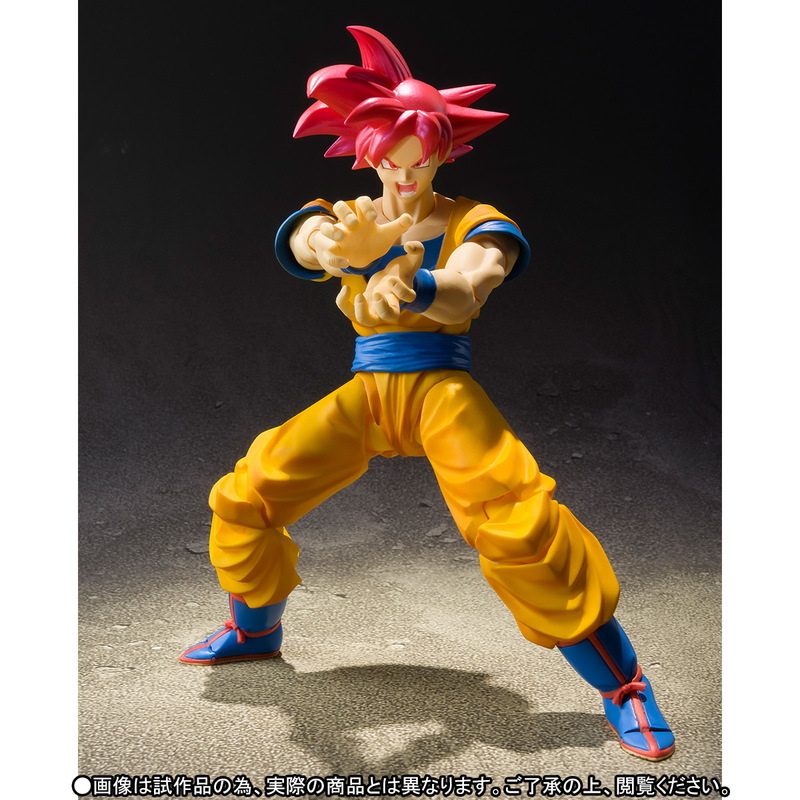 The Super Saiyan God Son Goku will be available for pre-order beginning May 19th. It will be released in October and will be priced at 5,616 Yen (about $51 USD). See all of the new photos by reading on. I dig it, but I think the original one they showed was better. Skinny like the movie/show. Wish they would have stuck with that and added in the new articulation styles. YES I am glad this is coming out. Beerus and Whis felt out of place in my collection, and now they will fit. Also I just love what this form represents, and I cannot wait to see what this guy comes with. I'm going to pass on this. I see no reason to own this version when he barely did anything and blue is superior. Just give me Kid Goku already. I hear that, and honestly I wish that too. It would be one of the few appropriate uses of that mold, plus it's more detailed. I'm just excited to get this version. 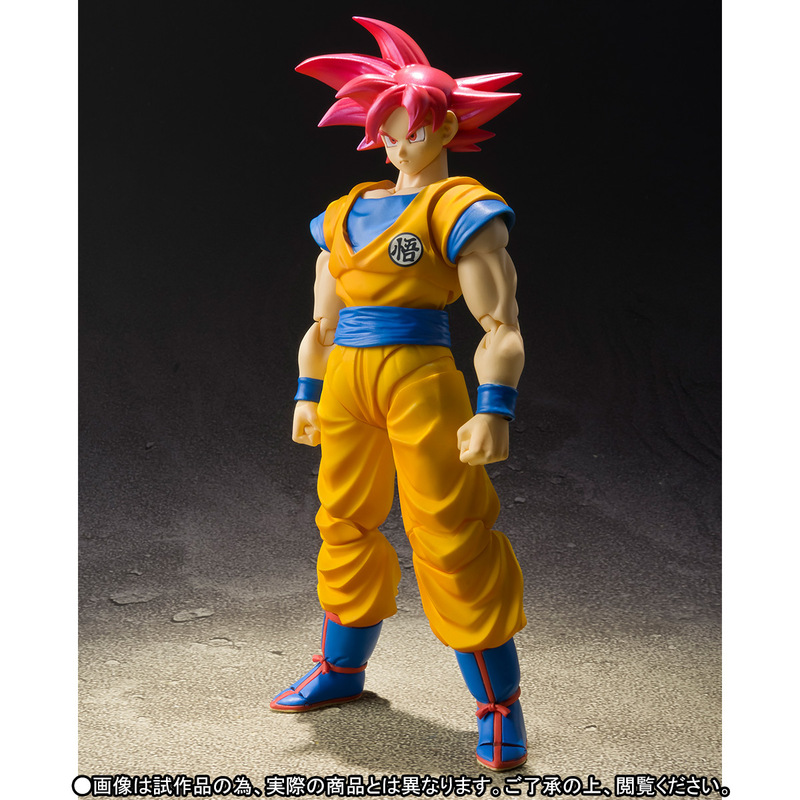 This also acts as a preview for the regular form Goku I am POSITIVE they are making. Technically I would agree but there's just sth so aesthetically pleasing with the headsculpt on this one that just makes me want to buy him. 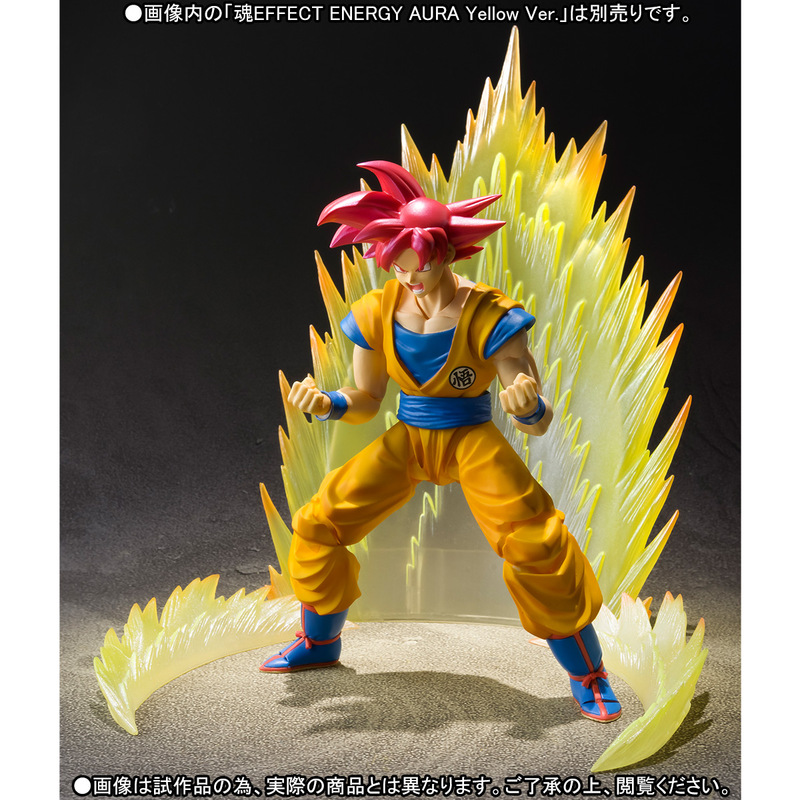 Tamashii Web-Exclusive, October release, 5616�. Included are four sets of hands and three different faces. Seeing the promo pics, I'm honestly a bit less interested. They're using the SS3 mold, and that's a bit bulkier than the standard/neutral form. I would have appreciated a new build that is reflective of that powered down body. Makesme concerned for the inevitable Son Goku 2.0. Concerned? We knew it was inevitable the moment they gave Vegeta a new body. I suppose I should qualify, Dr Kain. I was saying I'm concerned for the body mold of the updated Goku. 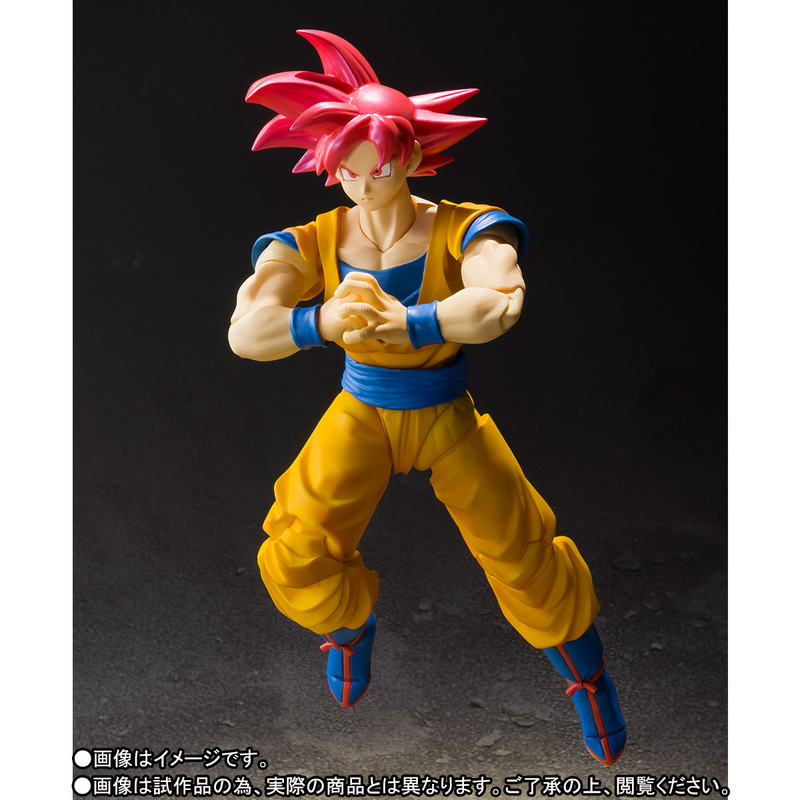 I knew it was coming and wanted one, but this body is off, even if Goku is a bit buffer. Looks pretty cool, but yeah, this figure shouldn't have the buffer build. Though I have to give them props. This Goku actually has the emblem on his chest. Too bad we can't see his back to see if he has that one as well. 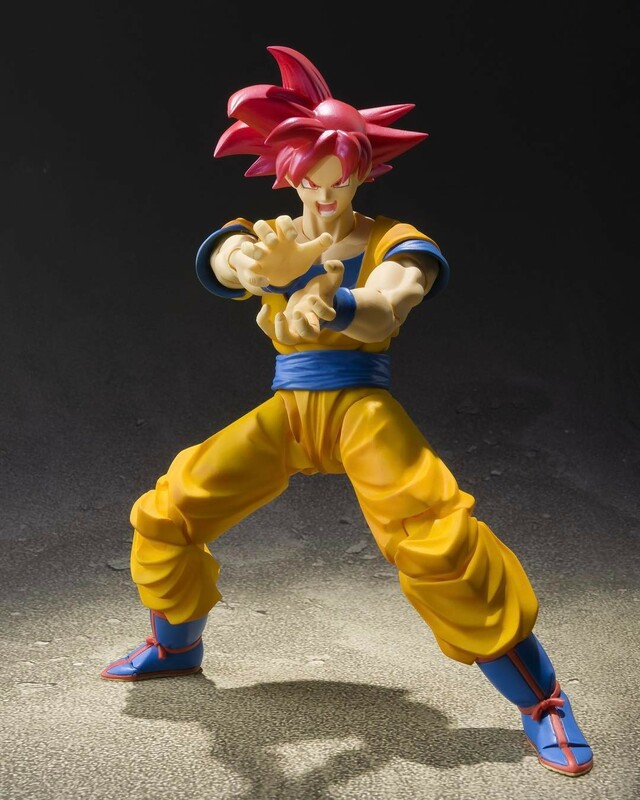 I m not exactly sure this is the ssj3 mold, the biceps and forearms look bigger in the latter than in the God form. He's only an exclusive in Japan. Is there info out there for a US release? Can i not do international shipping to the USA from the Tamashii site? Not yet. Bluefin usually takes a couple days. He's up on several retailers now. Admittedly, no, he's not as buff as the SS3 version, so I suppose that's enough. In everybody's opinion is his gi yellow or just really light orange? 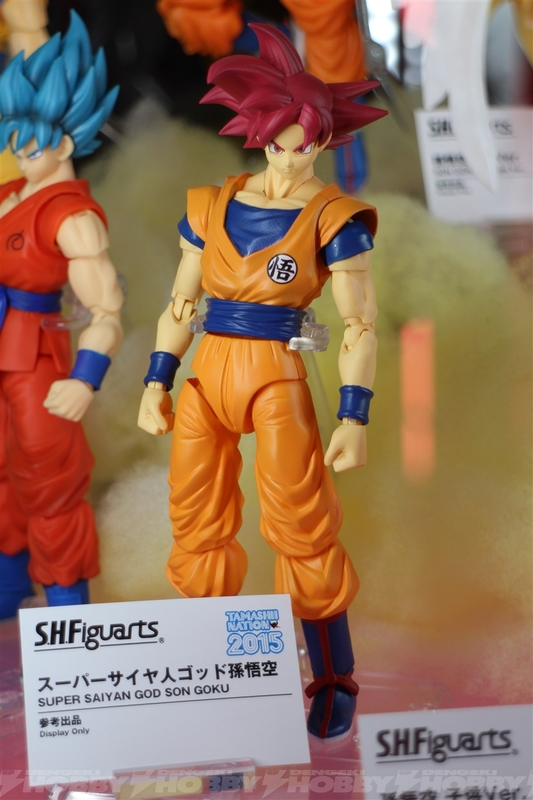 I was so excited for his prototype and it's painful how ssb goku was blood red, now this one looks off color too. 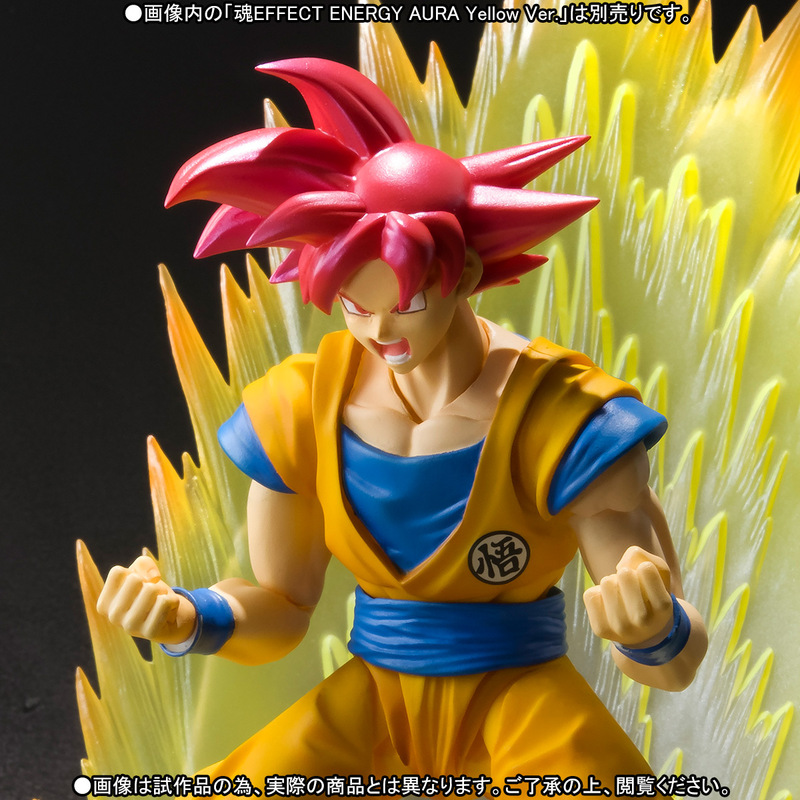 Hopefully this mold is used for Goku 2.0 (the kanji will make him accurate to DBS) and hopefully that figure is colored correctly.